The Seventh-day Adventist Church can well afford to examine its pillars of faith from time to time. The experience will, without question, make them ours, as well as the pioneers'. Perhaps in this way the Holy Spirit can revitalize us all for a deeper dedication to the message we love. That was the most rewarding personal insight that came to me at the Sanctuary Review Committee meetings. The discussion group I attended devoted 14 hours during four mornings to various topics centering on the 2300-day prophecy, the investigative judgment, the sanctuary ministry of Christ, and the role of Ellen White in the formation of church doctrine. One sensed that this was a dedicated group of Bible teachers and church administrators earnestly searching their hearts and minds to be certain about truths under question. There was no attempt to force one's views on another. Each had an opportunity to test ideas. A remarkable consensus emerged in the group as each day's topics were thoroughly canvassed. The afternoon general sessions revealed that this consensus prevailed in other groups. The meeting was characterized by a loving concern for one another. Prayer and earnest conversations were very precious experiences. Every attempt was made to be fair to the views of Desmond Ford. Yet, it was clear that this group of church leaders regarded his views to be unsubstantiated in a number of key points, and that historic Adventist teachings on these vita) doctrines are reliable and can be reasonably supported from the Scriptures. Everyone recognized, however, that there is a continuing need to study the Scriptures more deeply to understand even better God's message for our day. The Sanctuary Review Committee meetings will remain one of the most significant experiences in my life. The opportunity to meet with SDA administrators and theologians gathered from around the world in an effort to discuss the meaning and relevance of prophecy, particularly the time prophecies of Daniel, the relationships between chapters 7, 8, and 9 of Daniel, the significance of Hebrews 6-10, and the role of E. G. White was of inestimable value to me. The "immunity" granted to the participants both in the seven smaller groups and in the plenary session provided the setting for very frank and open discussions of the issues under review. It was extremely gratifying to observe that although different theological perspectives were represented in the committee, thus occasionally engendering rather vigorous discussion, the Spirit of the Lord promoted remarkable consensus statements. Personally, I learned a great deal, was immensely benefited and blessed, and hope that such discussions will convene on a regular basis in the future. To have been one of the approximately 115 counselors who met in Colorado August 10-15 to study the sanctuary truths and related subjects was both a challenge and an inspiration. Having at tended other groups of a similar nature over many years, I can say with confidence that what happened at Glacier View was in many ways tremendous. Basic truths had been seriously challenged, calling for deep and thorough examination. Were our pioneers correct in their understanding of prophecy and theology? Would Adventists have to change certain historic beliefs? Looking over the group, most of whose members I had known for years, I recognized that it had been chosen to provide a truly balanced, yet thoroughly exegetical, examination of every facet of the problem. The group comprised trained theologians and exegetes, editors and world administrators. Each session was expertly chaired by the president and secretary of the General Conference, and the meeting will doubtless go down as a truly historic one. Digging into great scriptural truths was made doubly inspiring by the calm, spiritual atmosphere that prevailed. God was with us from first to last, and this brought in a wonderful spirit of unity. I believe that, after these days of intensive theological examination, the Advent message emerged fully intact and more appealing than ever. I praise God for the truth that unites our hearts. As my husband and I came to Glacier View, anticipation mixed with trepidation. We were aware that sensitive issues, having the potential to split the church, had been laid wide open. We approached our task with earnest prayer that the Spirit that had led this movement in the past would not forsake us now. As our committees worked together day by day, we saw a miracle of consensus take place. Varied groups, with a wide range of backgrounds and understanding, reached similar, but by no means stereotyped, conclusions. I personally feel that I need to have greater trust in the community of believers as it works under the guidance of the Holy Spirit. What I experienced this week will affect my teaching methods. I will use authoritarian, lecture-type methods far less, and will involve my students much more in personal and group discovery of truth. Our only sorrow—and it ran deep—was our inability to bring Dr. Ford into spiritual oneness with the group. The Sanctuary Review Committee provided an open, honest forum to study the church's historic position on the sanctuary and associated subjects. The sheer number of Seventh-day Adventist Bible scholars, New Testament and Old Testament authorities, and worldwide church leaders gathered in one spot was historic, impressive, and thrilling. I doubt that any subject of Bible truth ever had a more careful or prayerful review. The open discussions and freedom of expression convinced me anew that our pioneers were led to the church's position on the sanctuary through sound Bible teaching. Though none of them could claim formal theological training, by the guidance of the Holy Spirit and by their study, they were led to truth. I have come away from the Sanctuary Review Committee thankful for the beautiful message contained in the sanctuary. The understanding of how God has handled, is handling, and will handle the sin problem gives me wonderful assurance of His love for me and confidence of forgiveness. The atonement and the 1844 judgment-hour message came into sharp focus as defended by Scripture. I thank God for this truth. Glacier View, to me, became a real experience in freedom—freedom to grow into a unity of faith and doctrine. This freedom to grow was a reality be cause there was no desire to indulge an adversary attitude by which the Holy Spirit would be unable to work in our minds while we were searching for truth in the Word of God. I think that it was possible to attain this degree of unity in faith and doctrine only as a result of the deep concern and love, the spiritual communication of fellowship, the transforming presence of the Holy Spirit, the power of prayer that opened our minds, the personal relation ship with Christ, and the total commitment to the mission of the church that we all experienced during these few days in Glacier View. I express my gratitude to God for all of this. Never have I understood the patience and long-suffering of God as I did at the Glacier View meetings. These historic meetings were uniquely characterized by: (1) an unprecedented openness on the part of its members to discuss every conflicting opinion on every question raised with frankness, forthrightness, and fairness; (2) astonishing patience and long-suffering on the part of the chairman to listen to every opinion, interpretation, and argument presented by any member, for or against any position that was being reviewed; (3) obvious manifestations of the power of the Holy Spirit to bring about a consensus among the participants on all vital issues by bringing hidden truths to the fore. As nothing else has, these meetings helped me to see that: (1) God has prepared men in every crisis to defend His truth; (2) the democratic procedure, be cause it allows for freedom of speech, is a long, drawn-out process but that God honored it at Glacier View because it respects man's free will; (3) as anciently God sent His people prophets whom they mistreated and later His Son, whom they killed, so now He has given His church the Bible, which has not been fully comprehended, and then the Testimonies to help the church understand it more fully, but some are taking these Testimonies apart and aiming their darts at them; (4) if God's prophets are not inerrant, so much more is this so of our knowledge of history and Biblical languages. 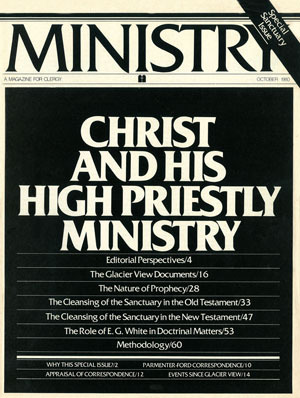 It may be the height of presumption at times to think that prophets are not inerrant but that dictionaries and history books are, or that our comprehension of history, Biblical languages, and contextual meanings is absolute and inerrant; (5) men unaided by the Spirit cannot understand God's inspired truth, which is revealed only to the meek who humbly seek Him; (6) what happened at Glacier View was permitted by God to help us dig deeper into the Bible as we have never done before, to prepare us for the day when we will have to defend the truth before kings, magistrates, and the keenest of minds; (7) some who are attacking the Testimonies are by so doing fulfilling the predictions of the very Testimonies that they attack, and confirming the divine origin of these messages; (8) the greatest among us today are not as conversant with Scriptures as were the humble founders of this message; (9) surface readers who are anchored no where and have put their trust in science falsely so-called will be shaken out. The meeting at Glacier View called to review the sanctuary doctrine of the church in light of Dr. Desmond Ford's position paper proved to be a very meaningful experience. The opportunity for church administrators and Biblical scholars to meet together in small discussion groups as they studied this important topic not only was informative but promoted a spirit of mutual trust and confidence. It was gratifying to witness the consensus that developed as the various group reports were presented to the full committee. A sincere desire to consider all points of view, to seek prayer fully for truth, and to continue to study this vital teaching of the church permeated the meetings. This historic meeting, I hope, has provided a model for periodic dialogue between church leaders and scholars, which should help to prevent future challenges of the type considered at Glacier View. Participating in the activities of the Sanctuary Review Committee during its recent meeting at Glacier View Camp, near Denver, August 10-15, was for me a most stimulating experience. Frequently I heard comments expressing satisfaction, appreciation, and occasionally even amazement, that the church was willing to come to grips in such an open manner with difficult theological problems. While initially I felt it might be impossible to separate personalities from the theological issues confronting the committee, in actuality the small-group session, as well as the larger-group discussions, focused on basic Bible truths in an objective atmosphere. The personal, friendly exchange of differing view points on scriptural teachings by a mix of the church's theologians, Bible scholars, pastors, and administrators encouraged and fostered mutual confidence and understanding among a vital segment of the denomination's responsible leaders. Although differences of opinion on some points were not fully resolved, the final consensus that emerged from the meetings demonstrated the basic and overwhelming support of the group for the church's historic position on the doctrine of the sanctuary. To me, it also demonstrated the importance of ongoing dialogue among the various thought leaders of the world church in a mood of mutual trust and confidence. The whole experience was refreshing, rewarding, and encouraging. I gained new appreciation for our careful and conscientious theologians and their concern for maintaining the doctrinal integrity of the church. I was also challenged to follow a more regular and careful program of personal Bible study.